la fantasia del tessuto è davvero bella!! And its true, this outfit is really beautiful! Love it! I like the patterns, the lace poking out and her pose. These Bari shots are just amazing! Its amazing just how beautiful this shot is. Besides the colors, and angles in this shot- I love the energy she is giving off. This photo, especially right above yesterday’s shot of the young woman give lots of food for thought. For starters, rather than seeing aging as a bad thing, looking at it as an interesting (and inevitable – if we are lucky) process. Her clothes are secondary to that for me. My mom died when I was about the age of the girl in yesterday’s photo. She had great style too. She’d be 93 this year — I always wonder what her aging would have been like. Thank you Scott for this thought-provoking post. Such a “humane” shot. I love how she uses the apron almost as a shield or crutch, lovely! Love seeing these grandmamas in their everyday dresses and cooking accessories. They make you wish to be invited in to sit at their tables and experience their wonderful meals. This one is even wearing a pretty slip. If you ask she will invite you… for sure! I’m from Bari and I know it.. :D Some of them is doing a kind of experience… You can go inside and you can enjoy a private lunch! I would like to be her sous chef for a day! Or even just peel potatoes and chop vegetables while she instructs me and tells me some great stories. Awww. She strikes quite a sweet little pose! I wish we could see a pic of her in her 30-40. SHE’S BEVELLING!!! (it’s a dancer pose for those don’t know what I’m on about) I absolutely love her and this shot – wonderfull!! It’s sweet that you think that she’s in a “dancer’s pose.” But it’s obvious that she suffers from terrible arthritis and that’s probably the only stance that is comfortable for her. You are wonderfully audacious! I thank you. Crone? Really? Seems like an unnecessary choice of word for a wonderful old lady…. This is not an insult. The Crone is the third aspect of the Triple Goddess — Maiden, Mother, Crone — and a identifies the wise “eldering” — ancient female energy that empowers a woman in the third stage of life. Yeah, right. Wait until you are her age and some young pissant calls you a crone. And it will happen. Make no mistake. Judging by the way the commenters usually react to pictures of old people, I get the impression that most of them have nothing to do with them otherwise. Vecchia è vecchia and has to put up with a lot. “Crone” is one of the three stages of womanhood. Maiden, mother, crone. The crone is the wise-woman and the one who holds the generations together. It is a wonderful time of life. Oh Ali, Jen didn’t mean anything bad. In some circles the wise wonderful older women are referred to as crones. Her comment alone – Beautiful Crone was made with great reverence. I think you´ve been extremely rude and sarcastic, there is no room for people like you in this blog. Do you think you are really funny… do you? Crone is not an insult. Simply one of three phases of a woman’s life. And there is room for all of us in this blog. The cheeky little leg pop is fab. And I really love the print on her dress! I love the nonna shots…my family is from Bari, and these remind me of my own nonna. This particular lady seems so refined…I love her funky glasses as well. Thanks for these! I’m loving these Bari pics!! So natural and so evocative! This picture is really moving to me. She has so much emotion in her face. Self-assured & grounded with her own style from the jewellery pieces to her shoes! Is there a peti-coat underneath the dress? On the extreme right looks like a peek of a lace work? She’s still got it! There’s nothing cutesy about this photo; I don’t know this woman’s age, but I have a feeling she is very young at heart. Look at her apron — it’s hand embroidered and she probably made it. And she probably made her cotton dress! A lifetime of creativity. I think you are right. It’s great! Yes, exactly what I was thinking, Lorea! She will undoubtedly also be a good cook! What a treat to see these neighbors, Scott! I love her! She is so alive. Beautiful, simple apron. My mother is 93 and still cares about her clothes. Where can I find a 100% cotton dress in a great print? You might have to make it yourself — or have it made! What an amazing photo, I love it and I love her! love it! from the apron and housedress that she made down to the worishofer slides. Very touching image. Apron probably homemade and hand embroidered. Beautiful little peek of lace from under paisley dress. Empathy for the older soul dealing with painful arthritis. wonderful. you have apparently stumbled on a treasure trove of great characters in this town. Her apron is beautiful. I love her pose. I think I see a very pretty slip under her dress – is this lace? And the whole picture, with the background is just really really beautiful. 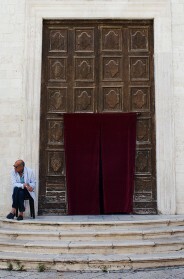 The pictures you took of the nonne in Bari are among the most beautiful you’ve ever taken! Those women are so beautiful! I più belle d’Italia! what an amazing shot, it rushed me..i had tears in my eyes. first time a pictures of yours was touching me like that. she looks so fragile and powerful at the same time. Thank you for this – it’s refreshing to see a photo of a person I can relate to … while I am obsessed with fashion and love ogling the pics of “fashiony” people … I find pics like this quietly resonate with me. 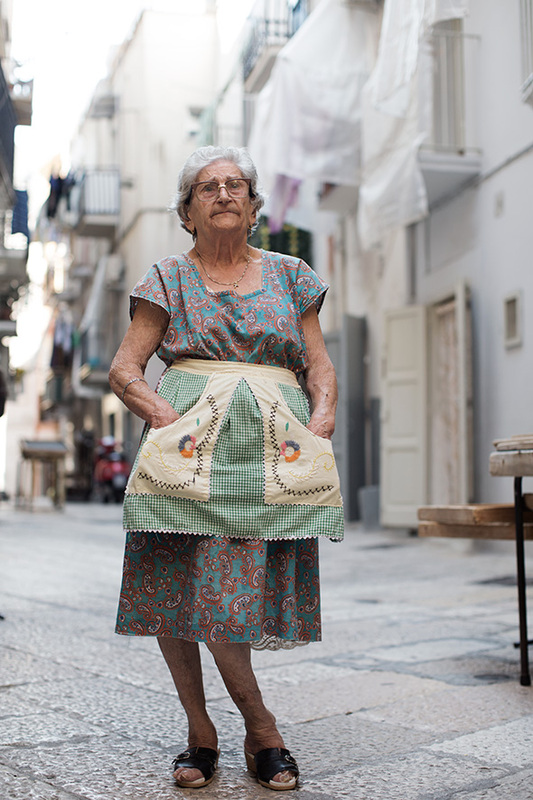 Just come in Puglia… :D They are lovely ladies that you can find in the streets… Making pasta..
What a seriously pretty outfit. So feminine. She’s got a story to tell. And I want a plate of whatever she’s cookin’! Beautiful like Arthur avenue in the Bronx . Lovely! The mix of patterns is really great. This photo brought tears to my eyes. Her face is full of emotion. I found the expression on her face particularly striking, deep in thought, or posing seriously for a photograph as most of that generation would tend to do. She reminded me of my grandmother. Of how the body curves with age and however beautiful and moving to the eye that maybe, it can also be physically and emotionally painful. This photograph really moved me. Thank you. I like that spunky pose. It’s pretty clear where Prada gets her ideas. Love your work Scott !!!!! I came to the site to get my dose of style, and got a dose of humanity instead. Well played. In complete agreement. Well played (and commented) yourself, Rivero! Unexpectedly moving…a sense of vulnerability. God! Look at this woman’s feet! Hey are so contorted! Is it worth it? I love all these shots! What an amazing range of beautiful people you captured in a charming city. Thanks! Oh how I love the dress. Did anyone notice the hint of lace from her slip peaking through. Wonderful. If I were to sum up my impression of this photo, I would imagine that the beautiful fresh white laundry drying on the balcony behind her has been a daily chore for her adulthood. She has worked hard to maintain an impeccable home and has given all her energies to her family. Her cooking is amazing and so is the extra plate she puts on the table “in case” there is a visitor. She loves her life, family and friends in Bari…………She is perfectly at ease in front of your lens, Scott, as she has spent her life putting her best foot forward. Thank you for introducing us to the lovely people of Bari. Simplicity at its best. the spirit never ages…Keep it up! Doesn’t she look super sweet, RESPECT to all nuns, God bless them and give them strong health and will to live a long happy life. I come from Bari and I know the style and the way of dress of these people! I love it and, watching this photo, I think about my grandma, she dresses the same kind of stylish dress. At the same time, this style is in tune with the way of being of this people: they always smile and they show the positivity in life in all respects. I hope my English would be understandable. Your English is much better than my Italian could ever be. :) So lucky to be in Bari! Thank you for this inspiring set of photos! The bit of lace peeking out at her hem is a reminder that older people have so much more to them than what is immediately seen, and so often ignored, on the surface. Love her apron. Love her. Love the photo. Thanks. Off the charts lovely! These recent Bari photos are all incredible. Thank you, Scott. beautiful! thanks for the touching picture! She’s absolutely adorable and the shoot is perfect. Reminds me of the film I saw on MUBI yesterday… Mid-August Lunch, I think the title is. Pics like this remind us just how deep fashion roots go. This is your best shot ever! I love it that you photographed this older woman who is beautiful in her own way. 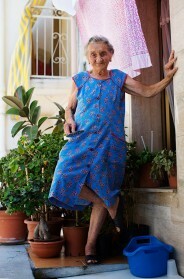 I love her dress, apron, energy that she has despite her age.. posing with her leg.. wonderful! This portrait just really got me! I am so used to playing attention to the way a person is dressed when I log on to your blog. I find myself doing the same with her clothes, but the attention to her outfit quickly changes to the view of the entire woman. There is surely a story here – caring for family, steadfastness and enduring. Really wonderfull addition to your daily gallery. ugly and sad. old and poor. has nothing to do with fashion. What makes you think that this lady is poor? Or sad? In my humble opinion comments like this make the commenter ‘sad and poor’ in attitude. Dear sikhi, someday you too will be old, your comment tells me that you have already reached ugly. What a sad, ugly comment. Poor you. Ahahah the grandma of south italy are the best, great picture ! Wonderful! She is so beautiful, so true, so human. I love it! Thank you for reminding me that aging is a type of beauty that speaks for itself— something to be revered, not feared. this is sooo south of the world…. I love you picture and I’m not sure if I love more Maria or this old lady! Well Maria is such an ICON, but this is really sweet… I love her leg movement and the dress… I’m sure u just stopped her doing Orecchiette.. Which types of street food have u liked more? This is a guide for everybody if you want to visit BARI and Puglia. Inside my picture of Maria delle Sgagliozze. I’m a little shocked by the comments from the, obviously, young people who don’t realize that this elderly woman is not “leg popping”, or “beveling”. She is in pain. Her “pose” is the most likely from hip issues. Or she has a deformity. I love that you include photographs of all ages…quite frankly after a while the genetically freakishly beautiful women get me a little depressed. Aging IS beautiful!! Not many (especially mass media) are willing to remind us of that. Thank you Scott for this photo and the Bari series ( hope there is more ). Has anyone else considered that this might not be a pose at all? And that she is crippled, probably with arthritis? An homage to all the grandmas of the south of europe! Go girls! The simplicity is the ultimate sophistication. This stands for Bari series of photos. Thanks Scott! sometimes seeing people who are not in Fashion is interesting! Her posture is really amazing! LOVE! I keep wanting to “like” these as if it were FB. The necklace, the bracelet, the petticoat and the nice dress, plus the apron and the brushing. She took care of herself when getting ready in the morning. This is real style! Thanks! I love your work, it is true art to me (and I am an art historian, so I must know…). Congratulations on the Bari as well as the Peru images, they should ALL be put up permanently in a museum to document the beauty of elderly women! And men! You have a very subtle and respectful approach to humans, chapeau! Style of southern Italy of a time!!! aaawww awesome photo. more of these please! Nicely written article that contains the step-by-step details which are easy for readers to comprehend.